I didn’t mean to take a blogging hiatus, but when you’re under the weather, you just don’t feel like doing much. I started feeling gross at the end of my work day on Thursday. Friday I was feeling worse, Saturday I wanted to curl up in a ball. But could I? No way! I had a birthday party to attend! Mr Man turned 6 on Saturday! My little St Patty’s baby he is and here’s a little glimpse into what I remember each time his birthday approaches. March 16 around 1pm I started to feel twinges that didn’t feel like they were going away. I kind of freaked out, I mean, baby wasn’t due for another month.. but alas, I called my doula. Her advice? Sleep. If they were still there, I was in labour. If they went away, it was just practice. I slept for about 45 minutes and awoke to stronger contractions. Eep. I picked Chef Husband up at 5, insisted I was ok to drive despite contractions (I think he was more than a little freaked out), and continued on. By 10pm, we were headed to our first hospital. I had been in a Shared Care program where it was hospital based but run by midwives. We knew that Mr Man was a footling breach so I wouldn’t be able to deliver vaginally in Edmonton, and given he was a month early, things weren’t really going according to plan. The midwife let me know I was 3cm and arranged for a transfer to a hospital. On to hospital #2. The OB could feel his toes through the bulging water sack and I was prepped for surgery. Mr Man was pulled out at 1:12am. He wasn’t breathing, he was blue, and he needed to be resuscitated and bagged. Over the next few hours I saw him for 5 short minutes while they tried to keep his levels of oxygen manageable. Eventually at 6am, the paramedic NICU team arrived and transferred him to another hospital. I only followed 12 hours after that. He was a fighter from the beginning, my little man, and he was named after a Roman Soldier as a result. At 7 pounds, 5 ounces, he looked nothing like a preemie, but on the inside, he wasn’t quite ready to be born. It was a tough go at the beginning for us, and he still has some lasting lung issues, but overall, he’s still a fighter. He’s sensitive, kind, compassionate, brilliant, funny, and kind of quirky in his own way. And above all, he’s perfect. He’s my perfect little first born. And my little dude has a serious affinity for all things prehistoric. Some kids go through a dinosaur phase. My kid IS a dinosaur phase. He’s been loving dinosaurs since he was 2 and could say T-rex. 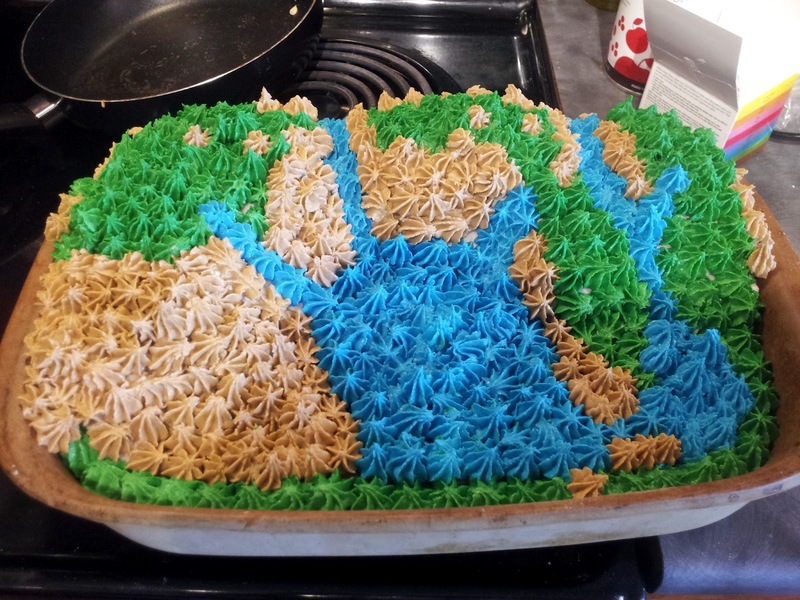 He knows the names of more dinosaurs than I can count, has met a paleontologist at our local museum, has been on dinosaur camps, and this year when I asked what he wanted his cake to be answered with “I think you already know mom. 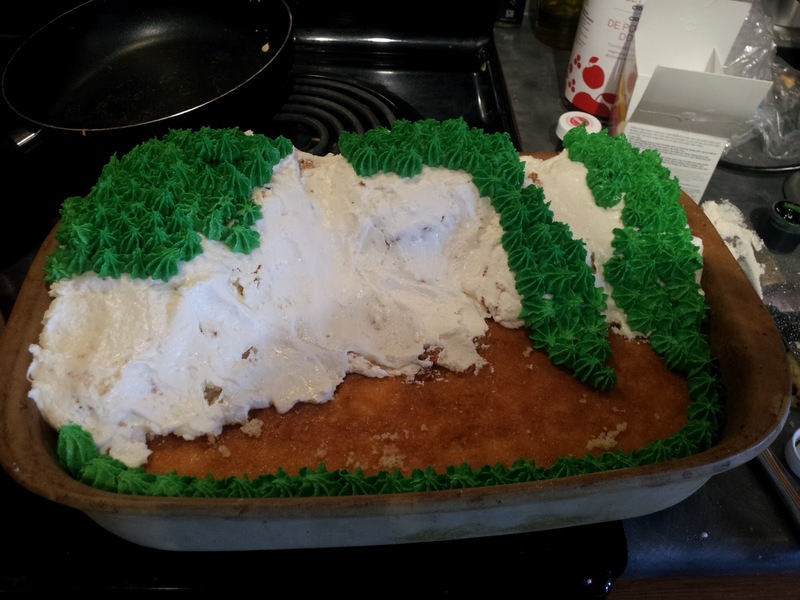 Obviously it’s going to be a dinosaur cake.” Well, son, you’re right, I should have known. 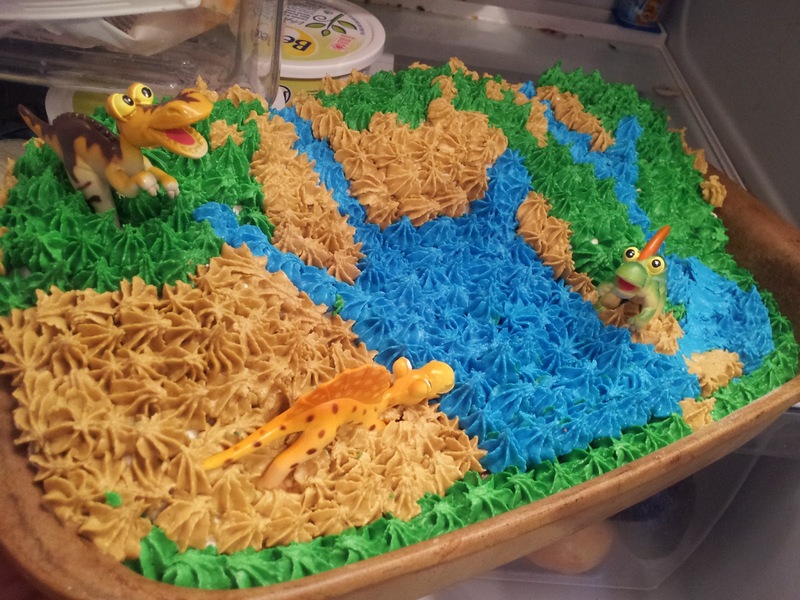 So a dinosaur cake I made. Have allergies or food restrictions doesn’t mean you don’t get to have good cake. It just means you have to know how to bake one, and how to have a little fun with colour. 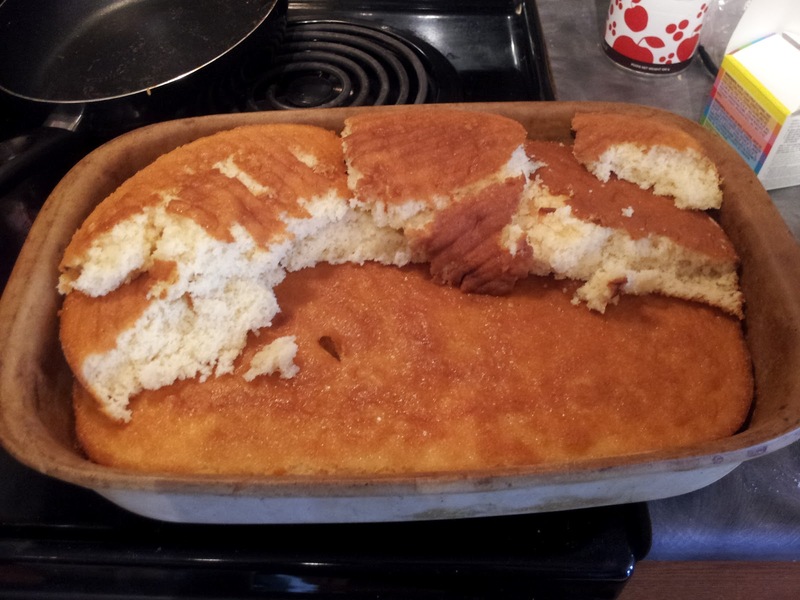 And so I present you with the birthday cake step by step. Assembling the cake took a lot of icing. 7 cups actually. I make my own – I find the store bought ones full of yucky stuff and wayyyyy to fake sweet for my liking. My icing is just vegan gluten free butter, icing sugar, rice milk and vanilla. And it tastes amazing. I loved making the little Jurassic Forest complete with watering hole, and Mr Man loved it. I had many compliments from parents (you can’t entirely see the height of it, but it’s the equivalent of 4 layers of cake in the back) including some from other bowling lanes that came over to see it. It’s not mind blowing – I’m not a cake decorator, but I’m pleased as punch with how it turned out and how happy Mr Man was too! I’m kind of sad that I only had 5 entrants, but hey, there were still 5 people who entered! Random number generator gave me the lucky number 5 as the winner! So congratulations to Heather! I’ll be getting you your cookbook soon! Stay tuned for a gluten free nut free birthday cake adventure! I’m so excited!! First of all, I went to my specialist on Tuesday to get the results. As some of you know, I was feeling rather apprehensive about this, but it turned out to be really good news! I don’t have EoE! Yahoo!! I feel really happy about it because I know that people who live with EoE have a difficult time – it involves a lot of scopes, a lot of diet management, and a lot of discomfort. So to hear that I didn’t have it was a relief. What that does mean is that we’re still not sure. It looks like reflux may be the issue, but I’m trying some new medications to see if they make a difference. Then I need to go for a motility test which doesn’t sound overly enjoyable. So that’s happy dance #1. Happy dance #2 is for my first giveaway!! Now, I like my slow cooker. Kind of a lot actually. I love the simplicity of it, the amazing meals that it makes, and how fast it usually is to clean up. After receiving More Make It Fast, Cook It Slow I decided that one slow cooker just wouldn’t cut it. Instead, I needed more. 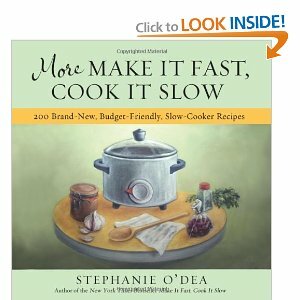 So I had Chef Husband buy a second one – a small 2 quart slow cooker for dips, and other recipes. So far I’m made a bunch of recipes from the book including 2 in one day! Sweet and Savoury Pot Roast – Sauce = amazing! Pad Thai – even Mr Man loved it! Puffy Pizza Casserole – yum! Loved this! Triple Chocolate Cake – This lasted almost a week because we’re not big dessert eaters but holy man. I don’t even like chocolate cake and this was mind blowing. And I have to say, so far, I have loved every recipe. 1. The book uses ingredients that everyone would have! It doesn’t have fillers, shortcuts, or processed items. It uses stuff I mostly have in the pantry or the fridge. 2. The recipes are FAST! I didn’t spend more than 10 minutes making a recipe and that one was the Puffy Pizza Casserole where I had to brown the beef first. My kind of book! 3. All the recipes are inherently gluten free (but can be made with gluten if desired!) 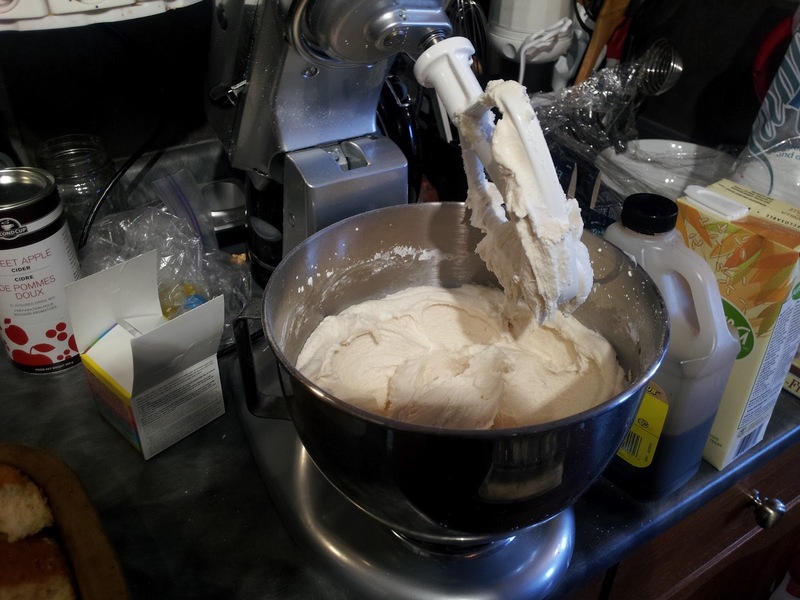 – I also have found it quite easy to convert recipes when needed. The Puffy Pizza Casserole we made dairy free. Pad Thai had no fish, Bread Pudding we made nut free and I made it dairy free as well. All were wonderful! My favourite thing is that the cook book is split into sections – under $7, under $10, and under $15. It’s very easy to make a great meal (often with leftovers) or an amazing dessert (that feeds a million people which may or may not be an exaggeration) without spending a lot of money. Stephanie, you out did yourself! Thank you!!! So, now the exciting part. I’m giving away one of these books!! * To enter a third time, share this giveaway with your friends on facebook! I will make the draw in one week on Friday, March 16 at 5pm my time (Mountain Standard Time). That’s 7pm EST, 6pm PST. I get requests for my husband’s Coconut Yogurt recipe all the time! Why? Because here in Canada, we can’t buy coconut yogurt very easily. When Miss A was diagnosed with her food issues, dairy was cut out, but then so was soy, and I was unable to eat soy as well. Miss A had been eating copious amounts of yogurt so taking her off it cold turkey seemed .. well, difficult. So Chef Husband started doing some research into an alternative. After a lot of surfing the web, he stumbled upon some success. First, we invested in a yogurt maker. It cost about $60 but is worth every penny if you plan to make yogurt more than a couple of times. It keeps the yogurt at the right temperature the whole time without having to be diligent about checking the temperature. Also, we buy a yogurt starter. 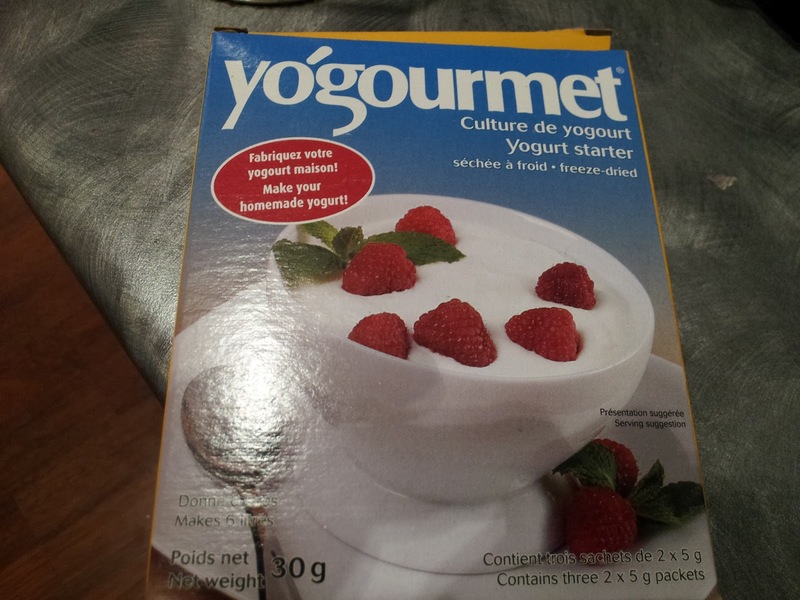 The one that we currently use has dairy (yogourmet), but there is an alternative called yo-life that is also dairy free. 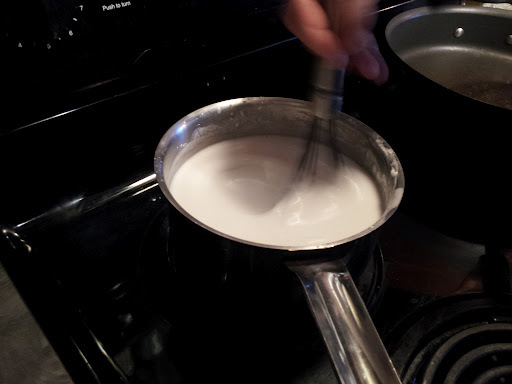 First step is to pour 2 cans of coconut milk into a saucepan – do not use the lite version as it won’t thicken! You want to heat the milk up but it does not need to come to a boil. Remove from heat and once it reached about 105F (it will have to cool down to get here), you can stir in your yogurt starter (once you’ve made it once, you can use that yogurt to start your next batch). Why can’t you add it right away? It will kill all the bacteria! Ladle it into your jars that came with your yogurt maker (or you can use mason jars) and let it heat for 4-6 hours. If you’re making it with dairy you need to let it go longer. *Note: If you use yo-life, you will need to let it go for about 12 hours. After 4-6 hours, remove and lid the jars, and place in the fridge. Voila! 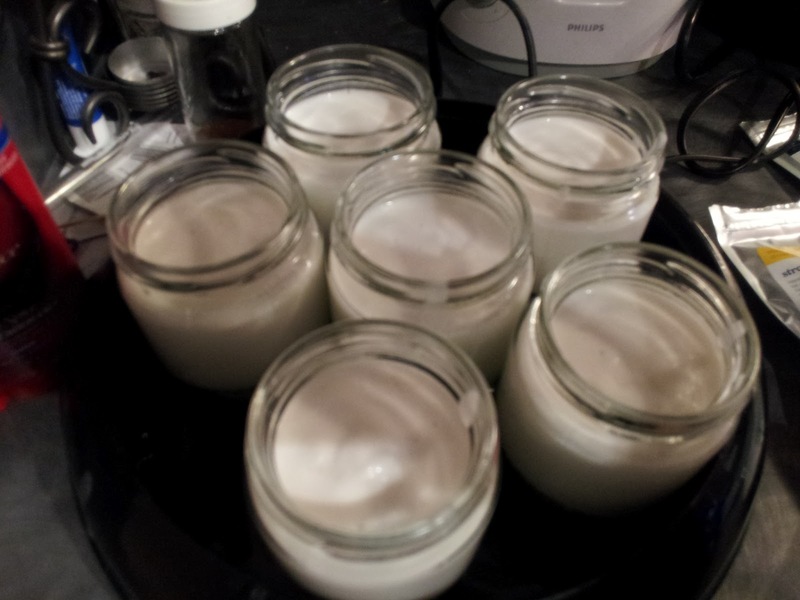 Coconut yogurt homemade! We use some multivitamins and liquid calcium to enhance the nutrients of the yogurt for Miss A, and we sweeten it with agave and real maple syrup. Both kids eat it for breakfast with cereal, as does Chef Husband! Stay tuned – within the next couple of days I’m going to have a giveaway!!! And, I will have the results from my second biopsy to share that turned out to be a lot more positive than I anticipated! Some of you may recall that I’ve had a couple of scopes. The first one showed some anomalies and some higher than normal levels of eocinophil – a white blood cell associated with allergy. It was thought that this was due to one of two reasons: severe acid reflux or Eosinophilic Esophagitis (EoE), an esophagus disease that has to do with protein allergies. After the biopsy results came back from the first scope, I was put on an anti-acid reflux medication for 4 weeks. After that came scope number 2. The point of the medication was to see if it reduced the levels of eocinophil. If it did, then the high levels were due to acid reflux. If it didn’t, the levels were caused by EoE. The first scope also saw my esophagus needing a dilation as there was some tightening that would have made swallowing food difficult. For a while, I had felt as though food was going verrrryyyyy slloooowwwlllllly down my esophagus when I swallowed and it wasn’t an entirely comfortable feeling. The medication resulted in feeling no different. I still had the same discomfort (and sometimes it turned into downright pain), the same amount of heartburn, the same nausea, the same gross feelings. At the second scope, I was told I could stop taking it since obviously it wasn’t doing much for me. The second scope resulted in a multitude of biopsies and I swear the next day I could feel every single place they took one. It felt like food was going into all these little holes and every time I swallowed, I wanted to scream a little. Thankfully, that feeling only lasted for a couple of days and then I felt okay again. In the second scope, they found rings on parts of my esophagus (they took a picture and showed it to me too – super cool to see the inside of your body! I’m going to ask when I go to my appointment to see it and take a picture of it so I can show you all) which is synonymous with EoE. The biopsies will measure the levels of eocinophil in different parts of my esophagus and then we’ll know one way or another. Here’s what I know so far: I’m not dying. No kidding, that’s what my specialist told me when he called after my first scope. Some may think that’s a terrible thing for a specialist to say, but I have to say I love this guy. He’s funny, insanely informative, and always makes me feel really comfortable about all my questions and concerns. He knew that I needed to be reassured because I was feeling pretty nervous about why I was feeling so much pain, and reassure me he did. I go on Tuesday for the results of the second biopsies. I’m guessing the result will be EoE and then we’ll go from there. It will likely result in more food changes, but to what degree I have no idea yet. I know that EoE affects about 1 in 10,000 people (and the joke in my family is the rarer it is, the more likely it is that I’ll get it) and there’s not a ton known about how to treat it. So it will be a discovery IF this is what I have. Chef Husband is coming to the appointment with me (this is the first time I’ve ever wanted/needed him to come to a doctor’s appointment with me) to find out what the next steps are. He’s the one that does 80% of the cooking and 100% of the grocery shopping (I hate grocery shopping) so I figure it’s good for him to come. So blog friends, your thoughts and prayers would be greatly appreciated as I wait these next couple of days to find out what happens next.